Our Schuco bifolding doors review looks at two of the popular models within the Schuco sliding folding range. One is the ASS70FD the other is the ASS80 FD HI. Amongst professional installers and trade, this brand is regarded as being one of the best. In this in-depth Schuco bifolding doors review, we compare the two products side by side. We also tell you which other comparable doors you can look at when deciding which is the right folding sliding door residential projects. First of all, it is worth comparing what you get with both models of Schuco bifold. 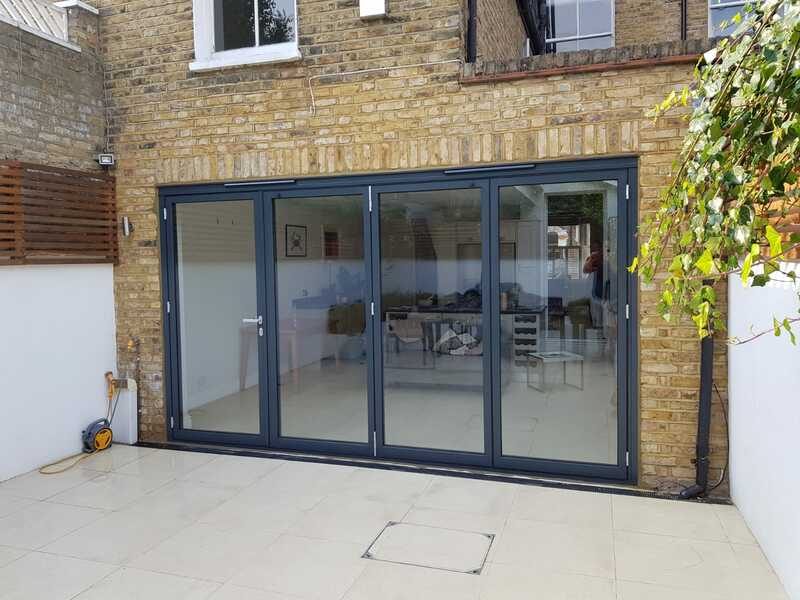 Most installers offer the ASS70 as this model meets most residential bifolding door requirements. Whether these are to replace old doors or as part of a new extension, this product meets virtually all needs. The ASS80 FD HI (high insulation) offers a few differences and is also more expensive. Therefore our at-a-glance-guide illustrates the main differences between the Schuco ASS70 and the ASS80. In total there are five different bifolding doors from Schuco including non-thermal, steel and commercial systems. These two are suitable for the home improvement market. The Schuco ASS80 FD has enhanced thermal insulation thanks to additional gaskets as well as extra insulation within the aluminium profiles. It is noticeably slimmer as well as having a slightly thicker glass unit capacity. Otherside the doors are fairly standard when compared side by side. For most people, the ASS70 FD is the door to choose unless thin sight lines and thermal performance are top of the list. Our prices are approximate only, based upon a grey, white or black bifolding door, supplied and fitted including VAT. Prices vary from company to company. Information about Schuco bifolding doors. Talk to any professional installer and Schuco is their top end brand. German designed and engineered, made in the UK and with a long reputation. Few products have the brand kudos of Schuco. While Schuco bifolds don’t have the exclusivity of one factory only making the doors, this does not detract in any way from the product. Schuco fabricators are vetted, trained and approved by Schuco themselves. So while they don’t have the only made by one company label such as Origin, Centor, Sunflex or air doors, they do compare with all of these brands. Some manufacturers such as Dutemann in Kent make an enhanced version of the Schuco door having a better lock, different handles and some other features. However, it remains essentially a genuine Schuco product. Are Schuco doors the best bifolding doors? As we say many times, there is no overall best product. Every bifolding door offers different features, price points as well as design. However, what Schuco doors do give you is a better overall product. Above all, the slide action is what we think makes these doors outstanding. We talk to many installers of bifolding doors selling other excellent brands such as Origin or Reynaers alongside Schuco. Not only does the brand speak for itself, but so does the light and smooth operation and overall aesthetics. These doors come with slim sightlines, contemporary door furniture, excellent door catches and hidden design features. We delve into some of these in more detail. Reasons to buy a Schuco ASS70 FD or ASS80FD HI . Before we list some of the main design features in our Schuco bifolding doors review, we want to highlight one in particular. That is the integration of an opening window within a bifolding door panel. The ability to keep the doors closed and ‘open a window’ has been a feature of these doors for many years, but few know about it. What you get is a Schuco AWS 70 BS.HI aluminium window, fixed within integrated within a door panel, letting you tilt the window back for ventilation. Bear in mind this is an opening inwards window only. It does not open out. Although you will get a thicker sight line on the panel with the window, you also get added functionality. Talk to your local Schuco installer or get in touch with us for more information. 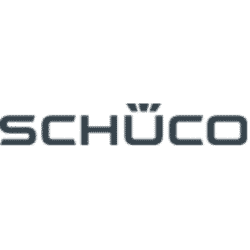 Some businesses such as Express Bifolds and Kloeber UK sell Schuco rebranded under their own brand names. These doors come in flexible configurations, a massive choice of colours and special shades and anodised colours too. In a non-thermal variant, they make great internal doors and room dividers. 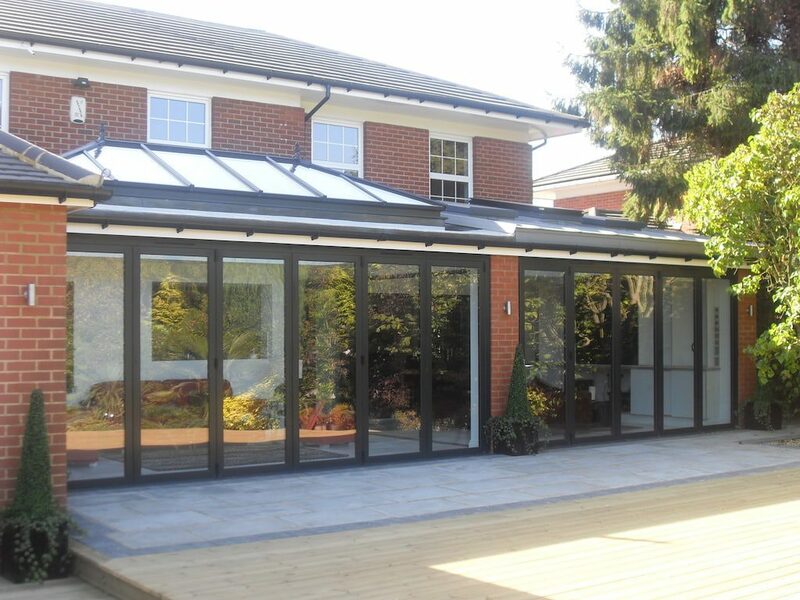 They also work well on a balcony and of course as an external bifolding door to the garden. These doors are not just for high-end homes. Many customers wanting a great brand of sliding folding door choose Schuco for its well-known reliability. The doors are energy efficient as well as very secure. 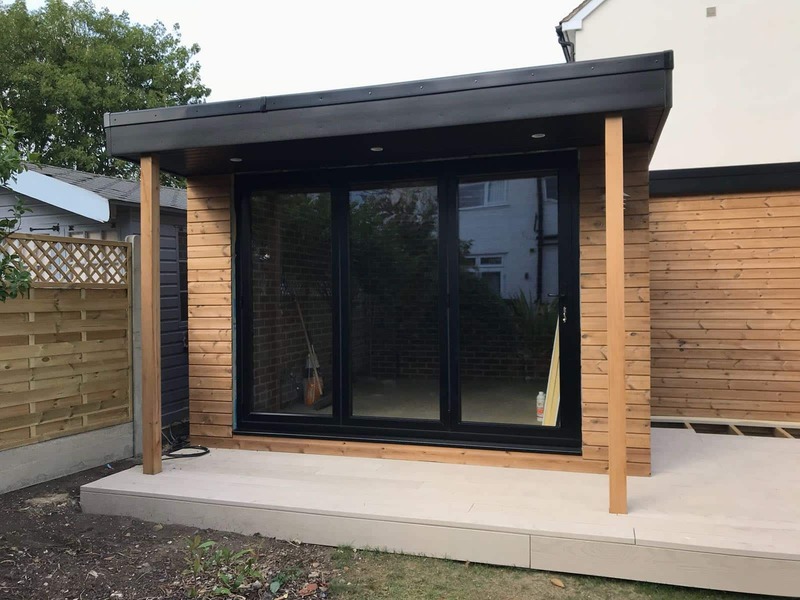 They do everything you expect from a bifold such as transforming a home or new extension with elegant and contemporary bifolds. Installers love to sell these doors and fitters enjoy working with them. Easy to fit and adjust, these doors have proved themselves dependable over many years. Correctly made and installed, they virtually guarantee a faultless service life. The brand name and reputation also sells the product as does the fact that it’s a German designed door. Not only is the Schuco bifold a modern looking door but it is also one of the thinnest on the market. The ASS70 has sight lines of just 120mm where the doors meet closed, and the 112mm on the ASS80. 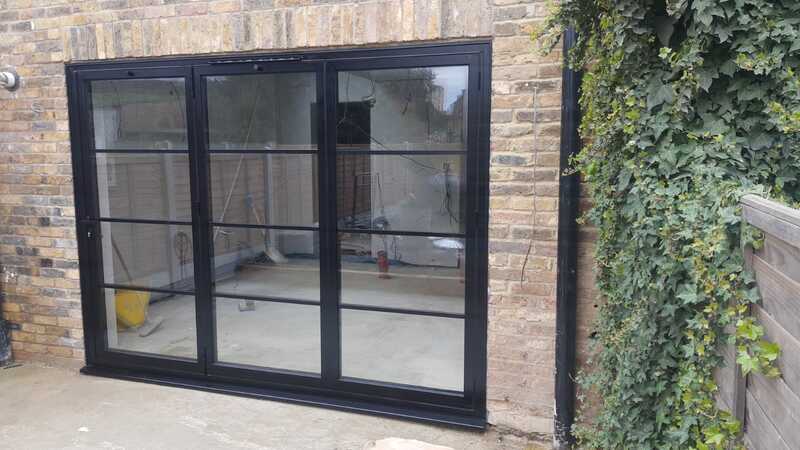 Furthermore, these are ideal doors to apply the right size glazing bars, also creating effective steel look patio doors. The slim sight lines also extend to the perimeter frame, with this door having an all round thinner profile than other doors on the market. Gaskets that move away with the door. Where many other brands use gaskets in the frame, Schuco doors have them positioned, so they move away from the frame when you open the doors. The quality EPDM (Ethylene Propylene Diene Monomer – a synthetic rubber) glazing gaskets. While these are there to seal the door, they cleverly prevent the black border found on other systems too. Both the ASS70 FD and the ASS80FD offer good thermal performance thanks to the premium-grade aluminium with polyamide thermal breaks. The ASS80 also has lower U-Values. This model offers extra insulation within the aluminium frame profiles and an additional large gasket in the outer frame. As a result, the sealing, acoustics and performance are better. As expected from a modern door, high security, weather performance and insulation come as standard. Doors come with multi-point locks, premium door locks and an adjustable frame jamb too for easier installation. This frame jamb helps overcome irregularities in building openings. Schuco doors come tested to established security and industry standards. And just like other products, the aluminium extrusions, gaskets, glass and powder coated finish are also to good specifications. Companies such as Sunflex with their SF55 and SF75 bifolding doors offer premium grade door furniture. Origin bifolds offer the Hafi handle upgrade. Centor door furniture is also one of the best you can buy on an exceptional sliding folding door. Schuco hardware is no exception. The door handles on the intermediate panels sit flush and look elegant. The lead door handle is separate from the door cylinder having top of the line metals and a very modern look. They come in several colour options. The door catches on the Schuco door while bulkier than other magnetic versions, further reinforcing the excellent engineering behind Schuco doors. Schuco bifold doors review. Comparable brands. 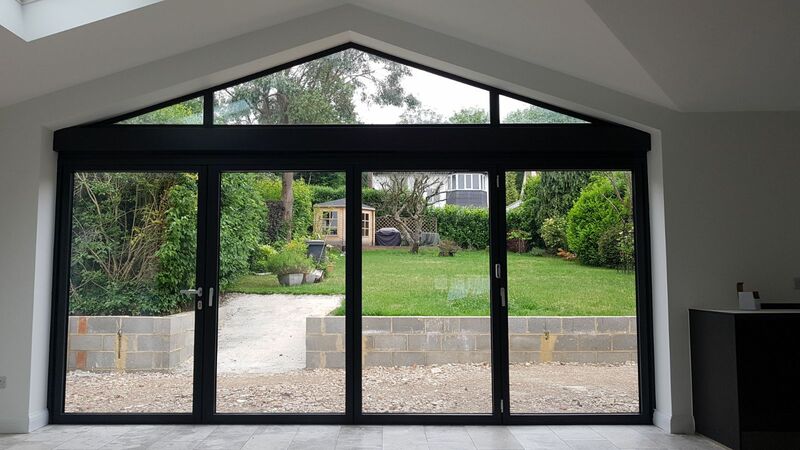 For the quality-conscious customer looking at good brands of bifolding doors, here are our suggestions for comparable products to consider alongside either the ASS70FD or the ASS80 FD HI. All of these provide an expertly-made door, very good design, comparable sight lines, premium door furniture and similar size capability. Most are also comparable to Schuco in price. We list these in our preferred order. 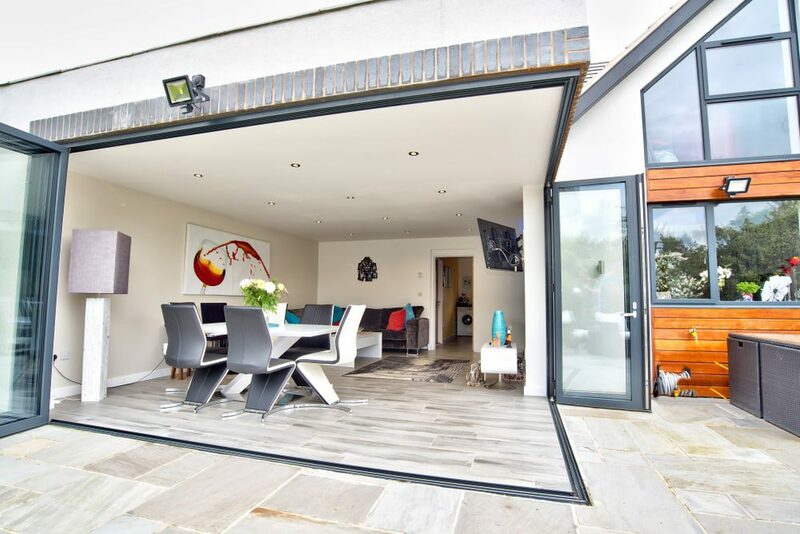 The Centor 335 is one of the very best folding doors for design, construction and quality. Slim, with ingenious design features as well as an excellent integrated screen and shading system. Well worth considering as a result. 2. Sunflex SF55 and SF75. Made in Germany and of impressive quality are the several bifolding door models by Sunflex. Slim, also with excellent components and one of the best known premium brands in the UK. This is one strong contender to compare with Schuco and especially the SF55e model. The service levels of Sunflex are also first-class. Schuco and Origin bifolds are frequently compared products and certainly worth looking at side by side. Origin, while not as slim as Schuco beat them on lead times and a bigger dealer network. For both the trade and the end user, Origin’s incredible lead times, as well as their dependable 20-year guarantee and outstanding service, are also good reasons to check them out. 4. Air 800 bi-fold doors. Available exclusively from Everglade Windows through a quality dealer network. The air 800 bifolding door is another high quality product with a 25-year guarantee. With similar sight lines, durable paint finishes, top-end hardware and other clever innovations. The air 800 is another strong contender to compare alongside Schuco. 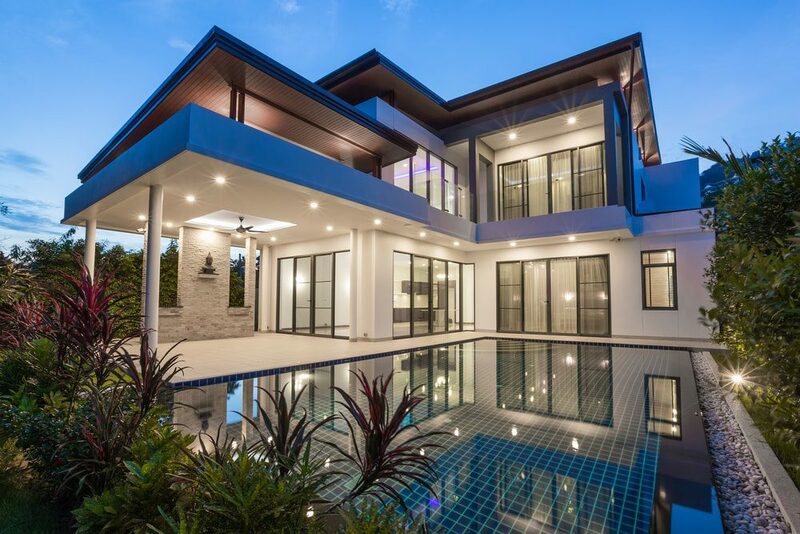 The CF77 and CF68 bifolding doors by Reynaers come from another world-renowned brand and well worth comparing with Schuco as well as Origin and Sunflex. Like Schuco, Reynaers products come from a nationwide network of premium installers. The systems company is also excellent in dealing with the end user when required. Also German-made and designed. Solarlux doors offer a big range of models and designs. Solarlux is also one of the longest established brands in the UK. We suggest you take a look at this door too when comparing with Schuco. Launched in 2017, Aluk’s premium sliding folding door deserves mention. Its cheaper and simpler Optio BSF70 bi-fold door is one of the best selling in the UK. The F82 provides a 122mm meeting stile and a very attractive pop-out T-handle as well as an overall high specification. It only comes through a select network of installers, probably explaining why it’s not that well known amongst good brands. That said, it’s an excellent contender alongside Schuco for price, design and appearance. Where you can use Schuco Bifold Doors. A gallery of Schuco bifolding doors in various new build and existing installations. Supplied and Installed by Aspire Bifolds of Surrey. Black doors with feature gable window. Open corner Schuco doors with flat threshold. Schuco doors with integral blinds. Black Schuco doors to a garden room. 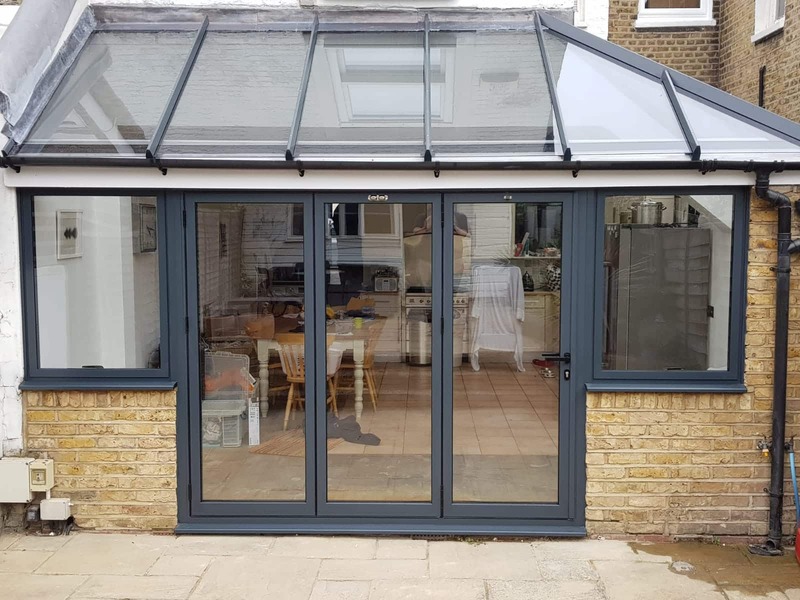 Existing conservatory with new doors and flag windows. Grey Schuco bifolds replacing old patio doors. Schuco bifolds with matching French Doors. Steel look black Schuco Doors. Schuco bifolding doors review. Conclusion. 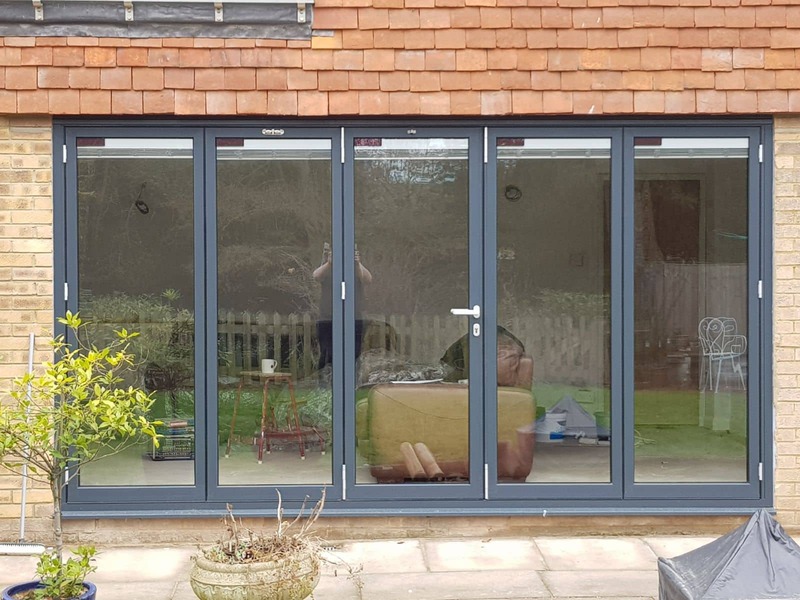 Whether as a replacement for old doors or in a new build project, the Schuco ASS70 is a sought-after bifold perfect for the residential or commercial market. Importantly, the Schuco name is one associated with world-renowned products and prestigious projects. 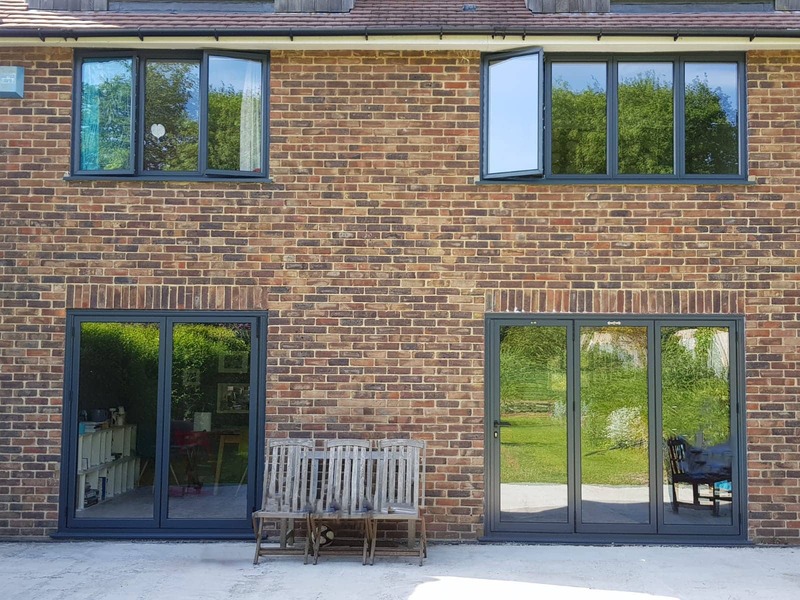 Just like other quality doors, we have never heard of issues with a Schuco bifolding door or the service levels from their network of reputable and professional installers. For the homeowner, this means added peace of mind. For the trade, selling Schuco doors is a great upgrade to Aluk or Smart systems doors. The trade and installers report this door sells itself, it is that good. While many systems offer large panel sizes like Schuco, the entire door comes with fine details all adding to its long term reliability and quality. The key difference with a Schuco door is the fine details and ensuring a good user and installer experience. There is no gasket friction, the hinges have extra sealing and the operation is faultless. Furthermore, the 10-14mm adjustment on the width with the 8mm height tolerance allows every Schuco door to have the precise adjustment other door systems lack. As always with such a good brand, check out who makes the door as many installers buy the product from the trade. A good installer will have no problem in telling you who makes their doors. There are many manufacturers of this door. You can even check them out with Schuco or you will see the relevant accreditations on their websites. Finally, the only way to truly appreciate the ASS70FD or the ASS80 FD HI outside of a written review such as this is to go try them out and compare with other doors. Use our contact form on this page to get in touch, ask a question as well as find out where to buy.